We realise that suggesting a two-seater convertible as a used buy in October may not be the most sensible idea, but if you're after an open-top motor, now is the time of year to buy one. Given that summer has most certainly been and gone, the interest in convertibles will dwindle and you're more likely to be able to broker a deal. After all, dealers don't want convertibles still sat on their forecourts come January. Plus of course, buying a decent modern convertible means that while you may not be that inclined to get the roof down on a wet and miserable morning, you'll still be well insulated from the cold and noise with the hood up. And if you want a high quality and enjoyable to drive two-seater convertible, we can't think of much better than the BMW Z4. It replaced the rather lacklustre Z3 in 2003 and was an altogether better driver's car than its predecessor. As with all BMWs at the time it is rear-wheel drive and with a 50/50 weight balance it's a rewarding and enjoyable car to drive. There were several engines available over its lifetimes. The hairy-chested 3.0-litre is the pick of the bunch with 231PS but the 2.5-litre - which is still a six-cylinder - is potent enough with 192PS. It's the latter we've found in the classifieds this week for a few quid under £5k. This is a car that would have cost at least £26,650 when new. Looking through the listings, you'll see plenty of 2.2-litre and 2.0-litre models. The 2.2-litre was a detuned six-cylinder with 170PS but it needed to be worked hard to access its more limited performance. Better was the 2.0-litre four-cylinder, which although slower and only providing 150PS, was much more fun to drive. What's attracted us to this particular 2.5-litre example is the reasonable mileage of 79,000, which isn't bad for a car that's now almost 11 years old - it was first registered at the end of December 2004. It has an MoT until next April and is simply a lovely looking car. The Z4 is rarely seen in over the top colours - the paint choices when new were fairly muted - but the good news is that it means it has aged well. According to the advert, the grey metallic paint has recently been machine polished and detailed, which explains why it looks so good. Add in the unmarked alloy wheels and chances are, this Z4 hasn't look this good for a very long time. The interior is in good order with those black leather sports seats unmarked, plus there's the advantage that this Z4 is a manual. It would always be our preferred choice in a fun sports car of this ilk over the automatic. But if you do want an auto, we found plenty for sale. As with any convertible, you'll need to check the hood works properly, although BMW convertible roofs have proven reliable over the years. However, you do need to watch water getting into the roof motor - it's located to the side of the passenger central pillar. It's in a protective bag as this area is prone to water run off from the hood. Water ingress to the motor that drives the hydraulics is quite a common problem - it can cost £1400 to replace the motor. As a convertible you can use everyday - even in the winter - and one with some genuine performance credentials with the handling to match, there are few cars to match the Z4. 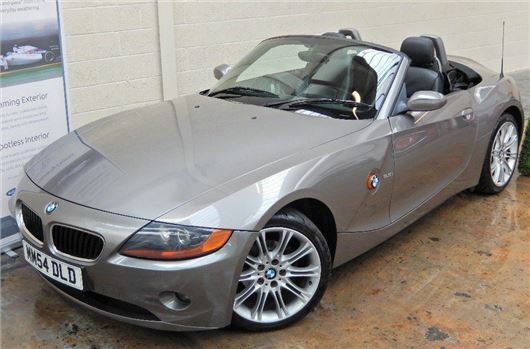 The once controversial styling has actually aged very well and this generation Z4 still looks a very modern two-seater. And at £5k quite a bargain.